Once again I am late with this blog, sorry people I shall punish myself later by eating a large kebab. So as an apology I am presenting a bumper blog. Also Mr JerkFromTheCoach will be doing some more writing for us so between the two of us you should never have to miss a rambling hung-over rant of any match! Also some new things for you to read and new ideas will be coming to this site. So stay tuned, but for now I shall start where we last left off. Me, The Missus and The Father-in-Law all jumped on the tube from Upney to Daggy East. I'd been looking forward to this match, a chance to see some old faces and with the chance of a taking a win off of a strong West Ham team would be (although pretty meaningless) a little bit of boost to my morale after our trip to stadium:MK. Leaving the station I noticed a higher than average "little oik" count, sadly one of the side effects of cheaper tickets for games like this. A quick visit to the cash machine in the newsagents we made for the club house and the pints therein. Inside with pints in hand we sat down for a little chat, WalesDagger Nikos, Mikins and Gemma joined us and we sunk a few and conversed before heading to the sieve for the battle of the day! 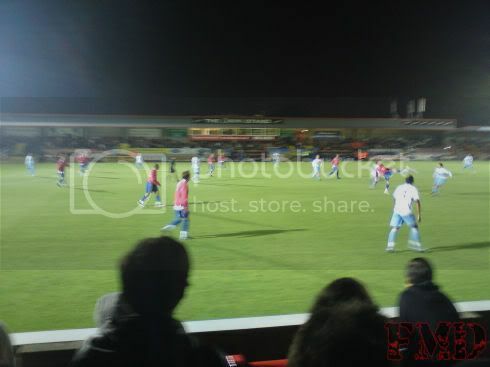 The Daggers took to the pitch in a Red shirt and the normal home shorts and the game kicked off. Within the minute the Hammers reminded us that they are actually a premier league club when When Benni McCarthy hit the net. 1-0 to West Ham. I know it was only a friendly and all that but I must admit to feeling the slightest bit of warmth under my collar hearing all the West Ham around me fans cheer for the goal. Suddenly I found myself really wanting to have something to cheer about, after all this was our terrace and if anyone should cheer from it, it should be us!! Half time came and a casual crossbar challenge was held as people Lined up for their burgers. The second half brought something for the Red and Blue army to cheer. On the Hour Josh Scott ran past two of the Hammers defenders and smacked it in. A bigger cheer than before went up as we celebrated the equaliser, a chant of "WHO ARE YA?!" started but with no real idea where we should point! Then a whole gaggle of substitutions were made, including bringing on Danny J Green (or Danny Green II, The Revenge!) so with two Danny Greens on the pitch me and my little group got to sing the song we had been waiting to sing since we heard we were signing our right wingers name sake. Although I cannot claim authorship of said song (I know it was someone on the old forum, to them I am thankful) it goes thus; *ahem* "One plays on the left, One plays on the riiiiiiight, we’ve got 2 Danny Greens, It's confusing as shite!" So to whoever it was that planted the seed of that song in my brain, I thank you! 5 minutes after our equaliser West Ham scored again, this time it was Freddie Sears who put it in the net to make it 2-1 and my heart sank just a little as the Hammers around me cheered. This was only made worse when Piquionne headed a corner into the goal to make it 3-1. But we Daggers had one last thing to cheer when West Ham keeper Ruud Boffin fumbled in the area to allow DJ Green to turn in a consolation goal. [Insert world cup related West Ham goalkeepers joke here] 3-2. With only a couple of minutes left on the clock all the Old boys came on. Although I would have liked them to come on earlier it was still nice to see some of the old guard. Every player that came on was treated to a cheer and a classic terrace song as west ham looked on and realised despite the result, this day was never about them. 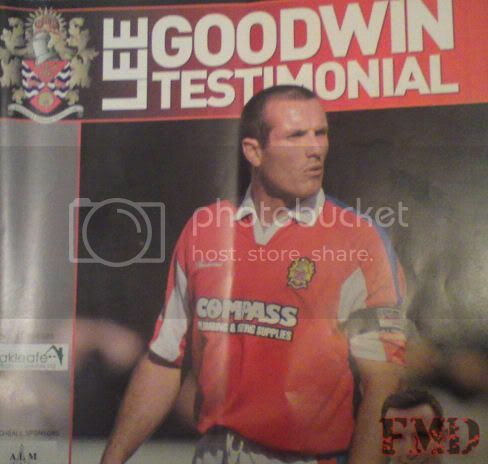 As the match was ended Lee Goodwin lead the team round the pitch to recieve their applause and we said a farewell to a Daggers legend. So not a bad match at all, West Ham were very gracious to send out such a strong team and i hope Lee made a nice fat wedge of cash to look after himself and his nearest. Also despite it being a friendly we saw some good performances and i was pleased to see Scott score, maybe this could kick start his scoring this season! The only sore point was seeing people getting hauled out by the police for various acts of stupidity, one of which i hear was a coin throwing . Seems a bit pointless for a friendly, but hey, what do I know? Saturday rolled round and so did the inside of my head, I was severely hung over after a little bit of a heavy night (and day) out previously. I was woken by MrsMetalDagger and got myself ready for the day ahead but I wasn't going to today’s clash against Walsall, I was going to Kent to celebrate my little sisters 13th birthday! I may not have been going to the match, but I knew someone who was! My day began bright and early with a rare outing to work on a weekend. I can pretty much say that this was the most eventful part of the day for me. Tube issues in the morning meant I had driven to Rainham to take the C2C to work, and thus was unable to have a drink before or after the game too – which didn’t really go a long way to help things. We arrived at the ground just after kick off, and made our way into The Sieve, and to be frank I was quite hopeful of getting three points against a side who were struggling at the wrong end of the table along with us. Watching us up front at the moment can seem a bit like watching that show where the contestants have to bend themselves into all kinds of shapes as a wall travels toward them – invariably more often than not they don’t go through the hole, and get knocked back out and into a pool of water. Now our shots don’t get knocked into a pool of water, but the shape of the goal is a lot easier to aim for than some of those body bending contortions – however you’d not think it by looking at our strikers scoring record. That’s something that I find quite concerning at present. Whilst I admire Bas Savage and his ability to hold up the ball (though his ability in the air for a big fella is questionable), it’s really not that much of a bonus if the players he is supporting shoot with less power or accuracy than an opposing defenders pass back. We are desperately in need of someone who is able to score, or at least make their goalkeeper sweat a little – and we are lacking anyone who will try and have a go from outside the box at present too. Combined, these factors really mean we aren’t looking dangerous, and aren’t finding goals from the players who should be scoring. The Daggers took the lead through a Darren Currie header following some good work from Danny Green on the right. As seems to be the way with us at the moment though, we found the lead too hard to hold onto and allowed Martin Devaney time to strike from the edge of the box to equalise and ensure that both sides went away with what neither of us really needed – one point. It’s these home games, against sides similarly placed to us that we really need to be taking 3 points from. Further note, I thought that for probably the third or fourth game in a row the standard of refereeing was just awful. I really fail to see how so many decisions can be so blatantly wrong. It’s often easy to blame the referee or his assistants when things aren’t going your way – and whilst things currently are not going our way, I’d be saying this even if things were. We don’t need the bad fortune brought on by a low standard referee at the moment, it’s not helping our cause - with referees at the moment we are having less luck than a ginger stepchild, but judging by how often it’s said, I sincerely doubt we are alone in that, and the standard as a whole is really something that needs looking at. In the end, probably 1-1 was about what we deserved, we got very lucky toward the end when a ball trickled against the woodwork in slow motion was cleared to safety. So two points dropped, not one gained definitely. Well another week of everyday normal life came and went until Saturday arrived once again. And once again the action was going to happen without me with a trip to Southampton to finance and the long hard act of saving for Bah Humbug already underway I knew I couldn't afford the trip to Rochdale! But luckily by the time I had dragged my carcass from the warm comforting grasp of tangled sheets there was already rubber being burned on the M1 by Mr FromTheCoach who was already well into an away day adventure that included; snakes, tailbacks, high speeds, Diversions and about 60 minutes of a football match!! Over to you Jerk! What a day what a day – and not an especially good one luck-wise. I did a mini cross country run which saw my early morning jaunt toward Acneland, the home of Rochdale broken up into three separate stages involving a road to nowhere with a drop of twenty feet either side and two huge ditches my reward should I lose control, a collection of some of the most bizarre looking and obviously related people in a village, and a Boa Constrictor. The action packed day began for me at 07:30 when I made my way to the car to begin the first stage of my journey north. This leg of it would see me travel east of Peterborough to collect a Boa Constrictor, along the above mentioned road to nowhere (I swear I saw a sign that said “Welcome To the Land Of The Nearly-Living”) and through countless villages with roads bumpier than a cystic lepers arm, and inhabited by the strangest looking people this side of Kent. I cannot stress enough how quickly I got out of there after collecting the snake, I felt like some sort of hero too liberating him from that madness he was born into. The Sat Nav informed me I was to arrive into Nottingham, my drop off point for the snake, at around midday. Plenty of time I thought for the trip onward to Rochdale. I made reasonable time and ended up arriving into Nottingham after passing The City Ground, The Cricket Stadium, and some prison-esque stadium in a poor area where I am told a team called ‘Notts County’ have played since 1336, at around 12:05. The snake was duly dropped off to a very grateful young lady, money was exchanged……. (Jesus, reading that bit back sounds seedy), and I immediately left to get into Rochdale as soon as possible. Up until then the roads had given my plenty of luck, were running free and smoothly, and had me feeling like lady luck was shining down on me and smiling fondly, as if proud of my achievements. Then, lady luck started to frown and spit in my face. Rain clouds gathered, winds began to howl, and I realised I was close to Rotherham, and belting it up the M1 at 80 (read 70mph if you are a police officer). Disaster struck amidst the rain and cloud, as my Sat Nav decided to turn white and stop working. When something goes wrong, everything goes wrong. Looking back, I should have turned back as a result was never going to go our way with things being this bad – but onward I ploughed. I decided to switch Sat Nav off and to head West from Leeds and onto Manchester’s version of the M25, which amazingly, is largely traffic-free every time I use it. I guess the locals are too busy recording Oasis-worship indie music in their cellars to be driving. I made it in the end to Acneland with five minutes of the game gone. I should have stayed away. My first gripe came at the turnstile. A fee of £20 was required for entry into the ground. For a League One club comparable in stature to our own, I think this is too expensive – and it shows when a crowd of 2600 are in a 10,000 all seater stadium – which I do have to say, is one of my favourite grounds to visit. The view is decent, the leg room good, the stewards aren’t too heavy when it comes to people standing. Furthermore the locals in and around the ground are a realistic, friendly bunch, and are very welcoming. On that, Rochdale would score a 10/10. 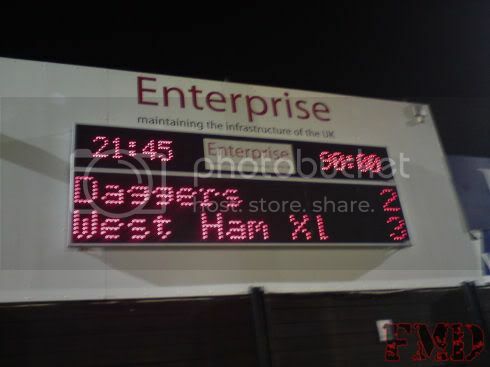 Dagenham away can be a frustrating team to watch sometimes. Some weeks ago, we had performed fantastically well at Charlton and at Colchester – only to travel to MK Dons and play like a team who’d been thrown together on the morning of the game. Rochdale picked up where MK Dons had left off, and we went in at half time 2-0 down. The refreshments at half time didn’t exist, beer wasn’t served, and only one kind of pie was available – apparently due to the turnout, which in fairness, isn’t how it should be, we paid the same money as the other 22 teams who go there will have to pay, if they want to take away from us the essentials then they could drop our ticket price accordingly, at the end of the day we aren’t getting the entire package for the £20 we paid, are we? Second half came round soon enough, and back out we went. After a decent break from us, Rochdale hit us with the counter attack 60 minutes in and went 3-0 up. Game over. A number left after seeing that goal go in, myself being one of them. This is nothing to do with turning our backs on the team, but there is no reason why we should be expected to sit there when the team doesn’t turn up. If we are in this together then we all have to be there, and as they weren’t on the pitch that was enough. I hope that it helped give them a bit of a kick-start, soon after leaving we got a goal back from Damien Scannell, and then a further goal from Mark Arber. The score remained 3-2 – but from what I had seen before leaving, Rochdale should have been home and dry. Again, to me these are the sort of games we should be taking something from. A point would have been useful, but we returned home with nothing. I arrived back into Dagenham a full 25 hours after leaving for Rochdale. The evening was spent with some Rochdale fans in The Church, a pub next to the ground. The journey home after diversions, accidents, more diversions and so on took a whopping 9.5 hours to complete. As I couldn't go to the match I listened to it on the Daggers Player and it didn’t make for the most pleasant listening, once the third Rochdale goal went in I closed the window and decided to play FIFA on the Xbox instead, where I proceeded to get knocked out of the league cup by Fulham. Out of curiosity I decided to check on the forums to see what was happening and to my surprise found we had closed the gap with 2 goals. I decided to leave the player off hoping somehow that would help as if my not listening somehow made the Daggers score. Sadly it wasn't meant to be. So before we close this rather long page of text and little pictures I have a couple of footnotes. 1, Well, Sunday was the FA cup first round draw, and I watched on the edge of my seat and was greeted by some rather pleasing news, first Helen Chamberlain yanked our ball out of the pot, giving us a home tie! (Finally!) Then Fat Boy Slim (who I’ve heard is mid coitus in the afterlife) handed us what could at least financially be one of the best ties for us to have, Leyton Orient! So naturally I am very excited about the possibility of a packed house local-derby cup-tie! And while it would be certainly foolish to think we're going to walk over our neighbours I have to say I really hope we stomp a metaphorical mud-hole in them and move on with £18,000 in prize money plus any gate receipts in the clubs pocket. 2 ,Today see's our first match in one of my favourite part of the season; The Essex Senior Cup!! Yes I know it's not the biggest and most prestigious but it's a nice local pride cup, we get a chance to play some of our old rivals, check out our second string team and it is (at £6 to get in) a bargain. Also as we have drawn Colchester (in the cups battle of the giants) we get a chance to dump out the team we lost the semi final to last year. So Colchester, I’m gonna cheer on our boys and hope for a measure of revenge! So we are gonna finally bid you farewell till next time. 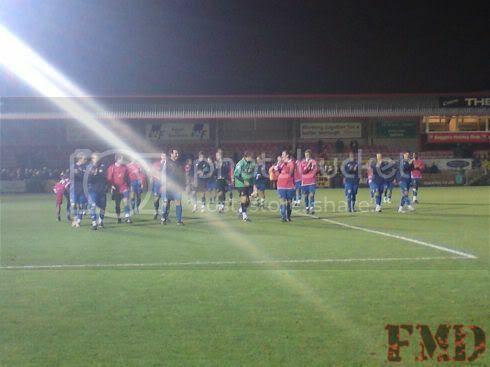 Next - It's the battle of the white trainers and fake tan; yep it's the Essex Senior Cup! !